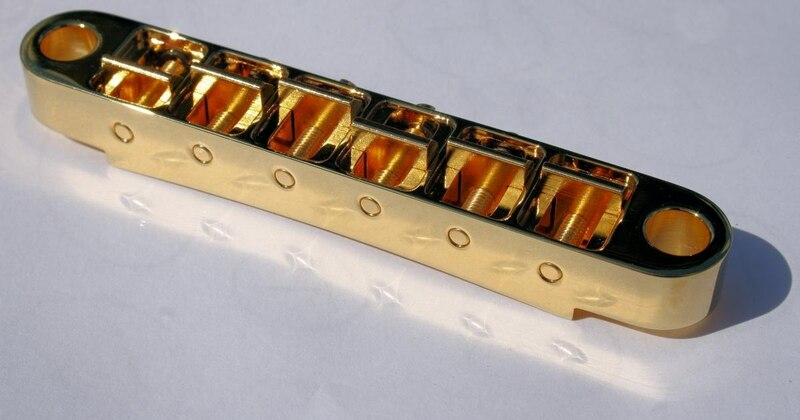 ABM produces what is possibly the broadest range of premium-quality Tune-O-Matic bridges and stop tailpieces in their product lineup. What makes their versions of this classic bridge combination head and shoulders above the rest? As a reviewer it is easy to use a lot of superlatives and comparatives. Bigger-cheaper-best-easiest, etc. Opening this product review, I realised that just using words wouldn't properly convey the correct emphasis and impact. 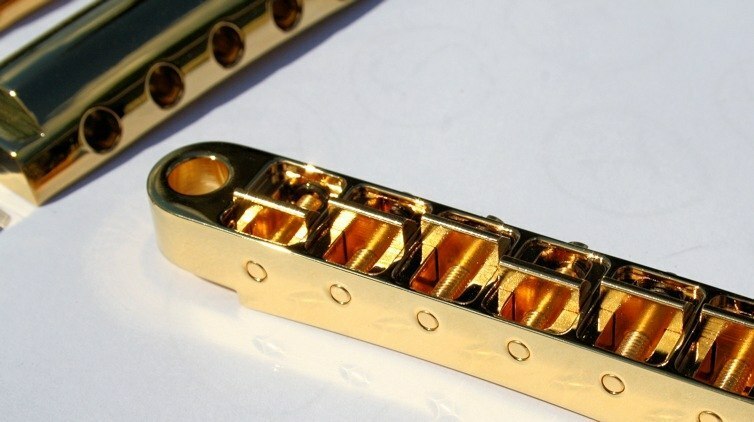 The "Tune-O-Matic bridge and stop tail" is a mature design combination and are common items produced by many manufacturers. Highlighting one more in the mix does not seem to really provide much useful information since established designs are usually done very well by the manufacturers that produce them. So a picture (or seven) is definitely worth a thousand superlative words, especially when they demonstrate one of the exceptions that stands out from the crowd. I am glad that I had some cotton gloves handy when unboxing these! The quality of ABM's design, manufacturing approaches and finishing virtually sings at you straight out of the packaging. The beautiful 24k gold plated finish on these components is flawless - so much so, it almost feels a shame that these will be mounted to an instrument rather than being displayed in a jewellers cabinet. The perfection of the surface finish - especially on the stop tail pieces - resembles the perfection of a mirror destined for a space telescope. Remarkable would be putting it mildly to say the least! ABM's series 2500 range consists of every combination of Metric, Imperial and conversion mounting possible in addition to ABM's custom-specification and finishing services, making sourcing the right parts simple. 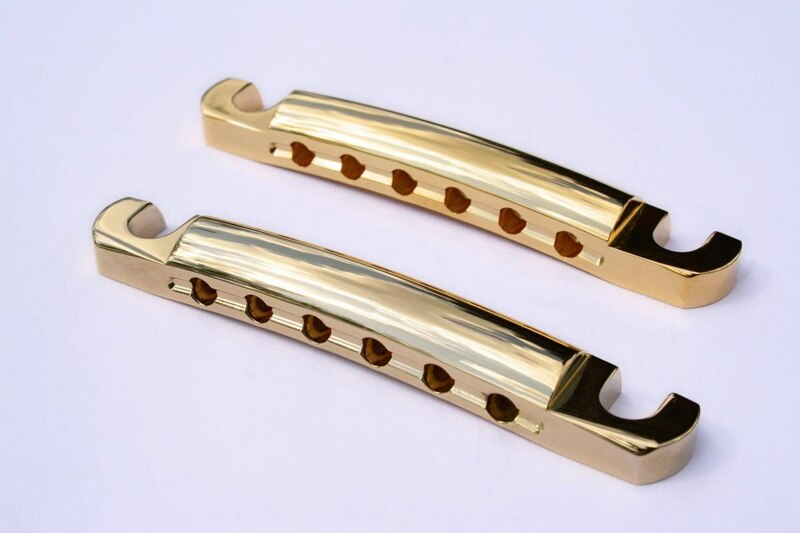 All of the bridges and tailpieces are available in resonant bell brass, lightweight aluminium or hard wearing carbon steel and are all outfitted with bell brass saddles. Designwise, ABM have positively evolved the bridge unit both in visual aesthetic and functionality without any fundamental alterations. Importantly to most, the intonation ranges have been increased significantly over ABR-1 and Nashville bridge designs, pretty much to their theoretical maximums. 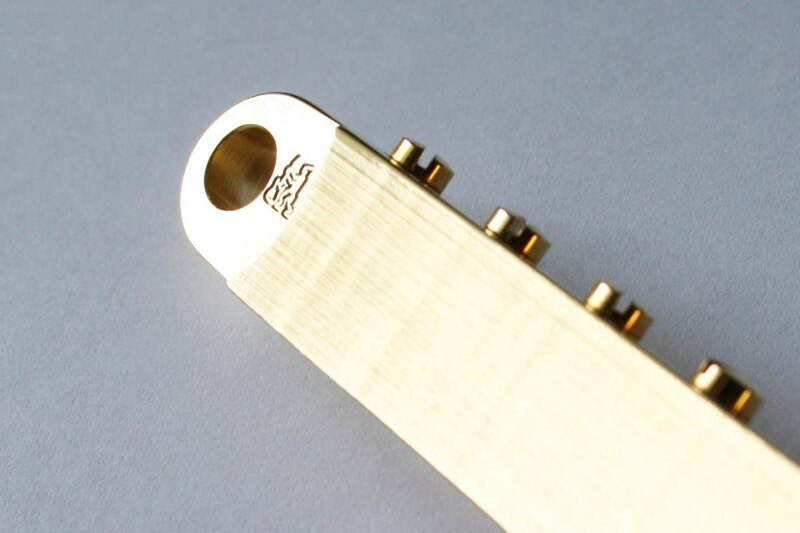 As a retrofit item, the additional forward saddle displacement may not be as useful the all-important rearward range however both will help tame instruments with problematic intonation. Out of the box, saddles are provided un-notched giving you the ability to select your preferred string spacing whilst on the instrument. Alternatively, pre-notched saddles with perfectly-angled falloff and witness points are also available from ABM along with an exhaustive range of spare parts should you require them. 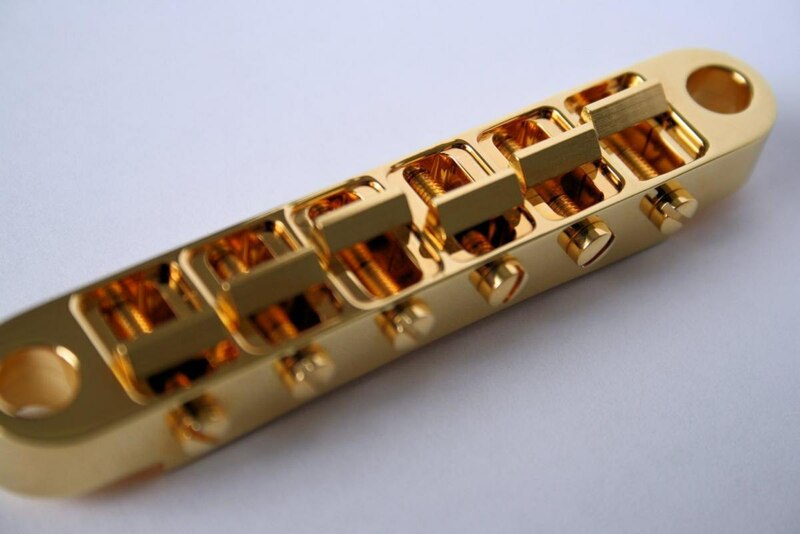 Visually, the milling and finishing of the bridge and tailpieces pays special attention to the show faces of the components. The curves of the tailpiece arches gracefully in the right places with complementary crisp and clean edges. Even the heads of the adjustment screws are perfectly shaped attractive features. Overall the components resemble fine jewellery, almost like comparing the paint on a plain dealership Ford to that of a Bugatti. All of the components are milled from swage-drawn metal rather than simpler die-cast stock. Physically, drawing makes materials more durable and eliminates the internal voids and inconsistencies which casting processes always add in. From a production standpoint, milling ensures that all dimensions are produced to exacting tolerances with none of the deformations or variances inherent in cast components. Ultimately this results in components that align and mate perfectly. 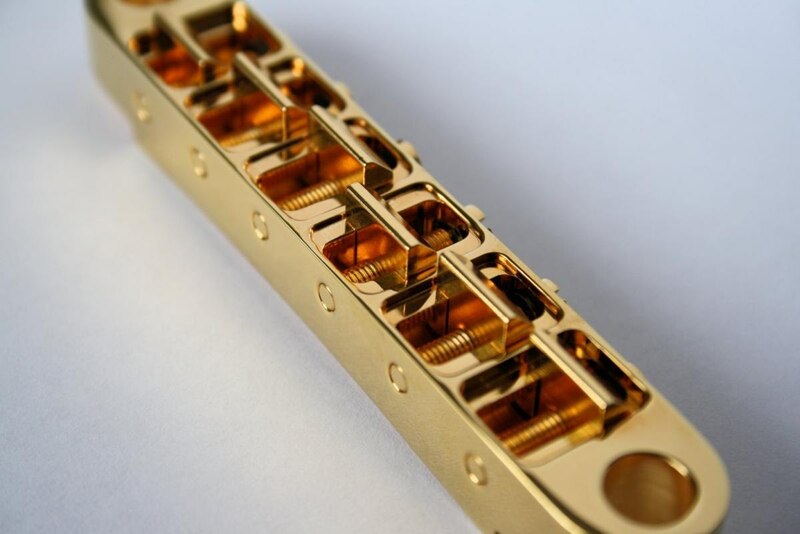 All of the bridge's saddles moved smoothly and consistently across their intonation adjustment range; whilst intonation is mostly set-and-forget, not feeling like you are fighting against a component that doesn't want to co-operate is gratifying and reassuring. In place, the bridge is confident and secure. No rattling saddles from loose screws/circlips, and a snug fit between the bridge and the height adjustment posts. All of the boxes for solid coupling are ticked. Whilst I do like the locking systems that manufacturers like TonePros use, the perfect coupling of these components makes that unnecessary. The actual components we unboxed were a 2506G Tune-O-Matic bridge and both a 3020G and 3020GA tailpiece. 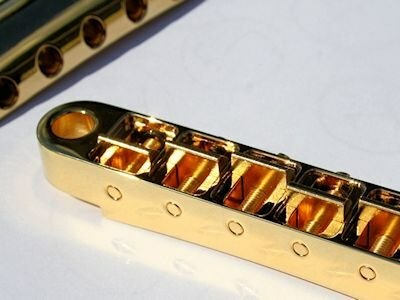 The 2506G bridge is entirely milled from bell brass (both body and saddles) and is patterned to fit M8-threaded inserts with 6mm posts. 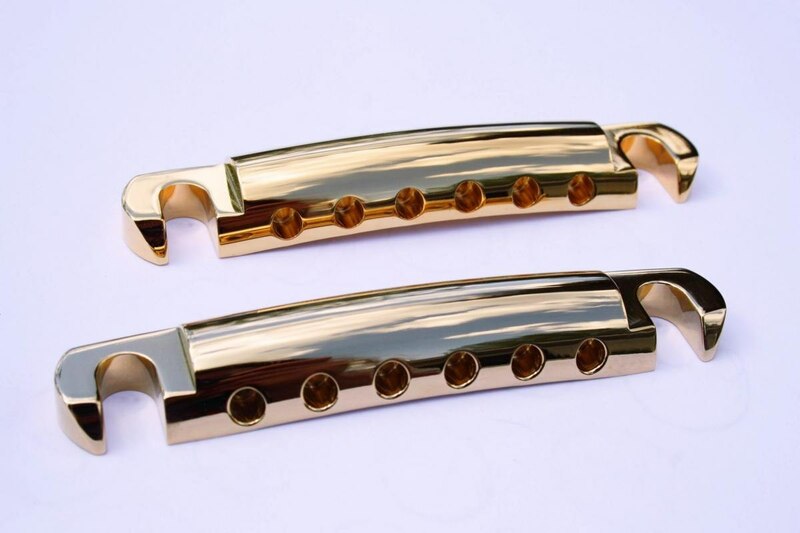 Other standard finishes cover nickel, chrome and black chrome however their excellent custom shop service can provide options beyond standard such as the true "lemon gold" 24k gold plating, levels of vintage aging and non-standard finish options. Certainly, as choices go for the most configurable in terms of dimensional and material options with the highest quality in all aspects ABM fulfil the spot of "price is no option here". At the same time, you are guaranteed returns in what you pay for. These parts demonstrate how a relatively simple component can be - and should be - elevated to the jewel in your guitar's crown. 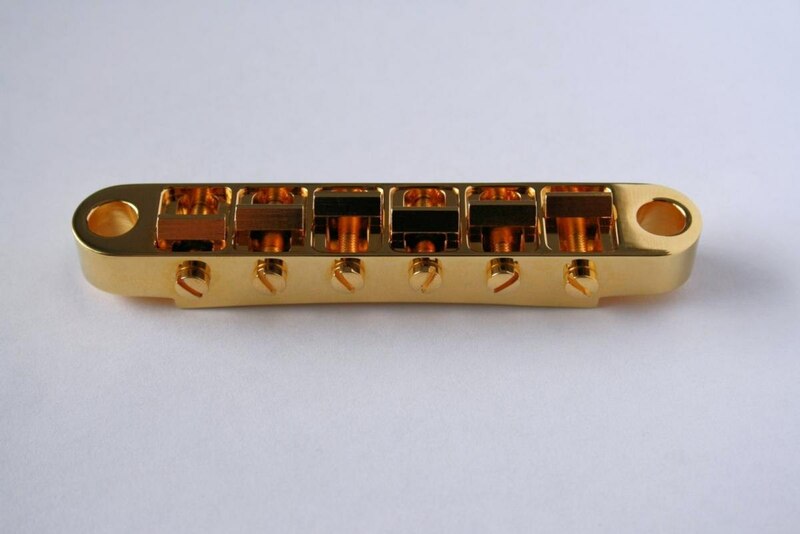 ABM continue to maintain their position as a premium manufacturer of guitar hardware without compromise. Their waste-conscious approach, ethical working standards and environmental initiatives (including plating operations) exceed EU guidelines, making them a world-leader in their field.